Birth: 5 June 1830, Boston, Suffolk County, Massachusetts. Death: 10 December 1910, Thurber, Wayne County, Utah. Died at age 80. Husband 1: Howard Egan (1815 -1878). Married 1849. Later divorced. Husband 2: Titus Billings (1826-1860). Married 20 January 1854. Later divorced. The Tuttle family became interested in the Church of Jesus Christ of Latter-day Saints after listening to the missionaries in Boston. In 1842, they migrated to Nauvoo, Illinois. After being taught by the missionaries again in Nauvoo, they were baptized on September 2, 1843. They were devout members of the Church. Mary Ann, her parents, and her sister, Martha Ann, received their endowments in the Nauvoo Temple on January 3, 1846. They were driven from Nauvoo by the mobs and her family was forced to flee across the Mississippi on the ice. The family stayed in Winter Quarters for two years before they were able to cross the Plains with the Brigham Young Company in 1848. In 1849, Mary Ann married Howard Egan. They lived a life of privation where they had to dig for roots, bulbs, gather greens, fish, and hunt for wild game. 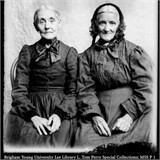 This marriage was dissolved by Brigham Young because of very disagreeable conditions between the two of them. They had a son which they named Hyrum William. As time passed, Mary Ann met Titus Billings and was married to him as a second wife. She lived in Manti, Sanpete County, Utah, where three children were born to them. Titus lived with his other wife in Provo and did not visit Manti very often. She and her children went out in the fields to glean wheat to make their bread. This marriage also ended in divorce. Mary Ann found work in the homes of other people and taught school in Manti. She left Manti and went south to Richfield where her sister’s family lived. When her divorce was final she married Walter E. Gardner on November 28, 1866, as his second wife. It was dangerous because of the Indians, so the families moved back to Fountain Green where they lived for a few years. Then they moved to Salem. Mary Ann taught school in both towns. After her daughter, Emily, married and was settled, Mary Ann made her home with them. Mary Ann helped to raise Emily’s children after Emily’s death at age forty-five. Biography Of Mary Ann Tuttle From A History Submitted To The Daughters Of Utah Pioneers, Repository: Daughters of Utah Pioneers Headquarters, Salt Lake City, Utah.